The SE had a relatively slow take-off during the first years following the entry into force of the SE legislation in October 2004. There were two reasons at the beginning: there was a certain reluctance towards a completely new company form and implementation of the SE Directive in a number of Member States was delayed. In 2008, the number of new SE registrations doubled from 88 (2007) to 174 new SEs. In the following two years the acceleration halted again. However, in 2011 the number of SE registrations rose again sharply, with 362 newly set-up SEs (compared to 211 new SEs in 2010). In 2012, another peak was seen, with 569 SEs registered. This ‘SE boom’ can largely be attributed to developments in a single country. As of 1 July 2013, the ECDB counts 1,865 currently registered European Companies. As known to the ECDB, during the previous nine years, 1,915 SEs were established in total, meanwhile 50 SEs have been transformed or deregistered. The SE had a relatively slow take-off during the first years following the entry into force of the SE legislation in October 2004. There were two reasons at the beginning: there was a certain reluctance towards a completely new company form and implementation of the SE Directive in a number of Member States was delayed. In 2008, the number of new SE registrations doubled from 88 (2007) to 174 new SEs. In the following two years the acceleration halted again. However, in 2011 the number of SE registrations rose again sharply, with 362 newly set-up SEs (compared to 211 new SEs in 2010). In 2012, another peak was seen, with 569 SEs registered. This ‘SE boom’ can largely be attributed to developments in a single country: 79 per cent of all SEs set up between January 2011 and July 2013 have their registered seat in the Czech Republic. In Germany, for example, the number of new SEs has remained fairly stable and levelled off at between 30 and 50 new SEs per year. SEs can today be found in 25 of the 31 countries of the European Economic Area (EEA). An important observation when looking at the SE and its impact is the very unbalanced distribution of SEs between the different countries. With regard to currently established companies,1 the Czech Republic (69 per cent) and Germany (14 per cent) host by far the highest shares of the overall number of SEs. Besides these two countries, significant SE home countries are the United Kingdom, Slovakia, the Netherlands, Luxemburg, France, Austria, Cyprus and Ireland. The ‘TOP-10’ SE countries together are home to approximately 97 per cent of all SEs. The large differences in SE numbers registered in the individual member states already indicate how cautious one has to be in generalising SE trends across Europe. The total of some 1,865 SE as such could be interpreted as proof of a certain acceptance of the new company form. 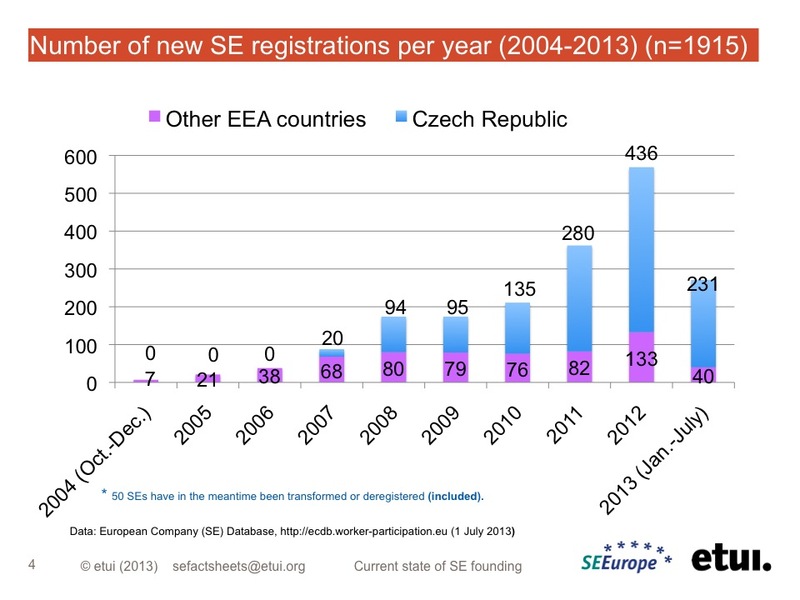 Nonetheless, even in Germany and the Czech Republic the number of SEs is almost negligible when compared to the total amount of new company registrations. For example for Germany, Eurostat indicates for 2009 a total of 297,000 new born enterprises and for the Czech Republic 115,000 enterprises. Overall in 2009, approximately 2.5 million enterprises were born in 22 EU member states available for comparison (Data: Eurostat 2012). In general terms, the SE’s impact on the company landscape in Europe therefore remains limited. However, some ‘SE hotspots’ have evolved that deserve a closer look, also because of the SE’s impact on worker involvement. The reasons for the (non-)success of the SE and the analysis of the effects on employee involvement must therefore be analysed, first, from a national perspective: for example, whether the SE is considered problematic or simply is largely ignored because no real development has (yet) occurred in a given country. Moreover, possible impacts vary significantly between countries, depending on national worker involvement rights. From an employee involvement perspective one has to keep in mind that even employees from countries where no SEs are registered can nevertheless be affected by an SE founding, especially in larger multinational companies.